I am sure that by now you are aware that the Promotion of Access to Information Act 2 of 2000 (“PAIA”) requires private bodies (including bodies corporate and homeowners’ associations) to submit manuals, compliant with PAIA. Section 32(1) of the Constitution of the Republic of South Africa, 1996, provides that everyone has the right of access to (b) any information that is held by another person and that is required for the exercise or protection of any rights. The purpose of PAIA is to ensure that this Constitutional right is upheld, and to ensure transparency, accountability, and good governance in public and private spheres. The Department of Justice and Constitutional Development extended the submission deadline for private bodies to Thursday 31 December 2015. We are pleased to announce that Paddocks is offering you, as managing agents and trustees, assistance with this process, by preparing and submitting individual manuals for each body corporate and/or homeowners’ association. Due to the imminent submission deadline of 31 December 2015, we urge you to contact us as soon as possible, should you wish to make use of this service. Please email us at consulting@paddocks.co.za with the number of entities you require manuals for. Alternatively, contact us on 021 686 3950 should you have queries. My understanding is that the Human Rights Commission has delayed the submission of manuals until 2020 for Bodies Corporate. Can you confirm this. The extension of the exemption has not yet been gazetted, therefore the deadline of 31 December 2015 still applies. 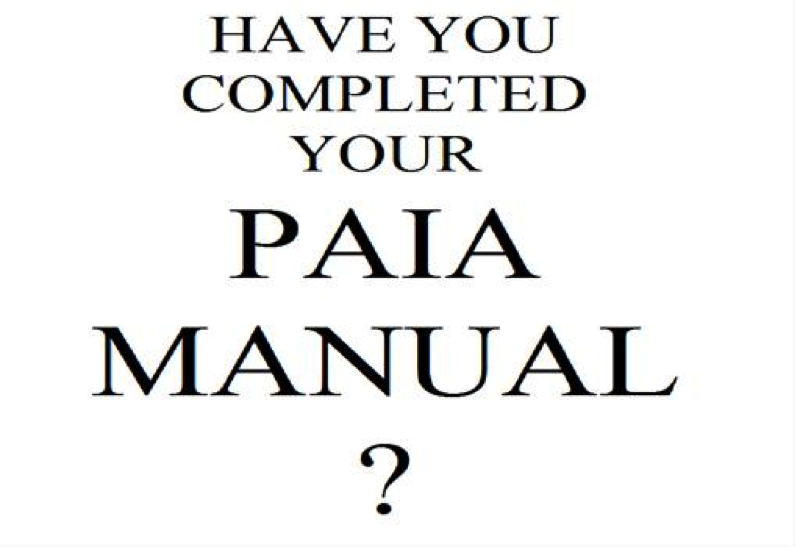 When the extension has been gazetted it will not apply to HOAs that will still be required to submit PAIA manuals by the deadline of 31 December 2015. This entry was posted on November 12, 2015 by Paddocks in Legal, management, Meetings, Online education, People and tagged constitution, consulting, department of justice, manuals, PAIA, promotion of access of information act.